Millions of vegetarians nationwide turn to veggie burgers and soy products as alternatives to meat, thinking they are making a healthy and ethical decision. While this is partially true, veggie burgers and soy carry their risks, and all veggie burgers are not created equal. Luckily, a little bit of research can help you sort through the dangers and make educated choices for you and your family. At the close of 2012, Veggie Patch brand burgers announced a recall of two of their products due to possible listeria contamination. 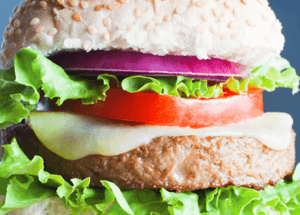 Luckily, their ‘Ultimate Meatless Burger’ and ‘Falafel’ patties did not cause any reported illnesses, as the bacteria was discovered during routine testing. However, the discovery raises some red flags. Listeria can cause headache, fever, muscle aches and gastrointestinal symptoms. It is especially dangerous for pregnant women, newborns, and those with a weakened immune system. While most commonly associated with undercooked meats, as this instance shows, listeria is still a concern for those on a veggie diet. The worst thing about products marketed to vegetarians? So many of them contain soy. Seen for a long time as a healthy, low-fat alternative to meat, the dangerous components of soy are becoming more widely studied. One danger is the way that many types of commercial soy are processed. A recent study discovered that various brands of non-organic soybeans are often soaked in baths of hexane to extract the oils. Hexane is classified as a ‘hazardous air pollutant’ by the EPA, and has been found to be a neurotoxin. A large enough dose of hexane can cause nervous system failure and skin problems, and although only trace amounts were found in the soybeans studied, it is not established how much hexane can cause damage to humans, especially in the long term. A limit on hexane consumption has not been set by the FDA. According to one researcher, “if a non-organic product contains a soy protein isolate, soy protein concentrate, or texturized vegetable protein, you can be pretty sure it was made using soy beans that were made with hexane.” Frighteningly, this chemical is found in most brands of soy infant formula. The list of veggie burger brands that use soybeans containing hexane uncovers several favorite and long-trusted names. Included are Morningstar Farms, Boca Burger (conventional), Amy’s Kitchen, President’s Choice, Franklin Farms and Yves Veggie Cuisine. Some brands that do not contain hexane are Helen’s Kitchen, Wildwood, Tofurkey and Superburgers by Turtle Island. Boca Burgers and Morningstar do offer hexane-free soy options, but make sure to look for ‘made with organic soy’ on the label. Silk brand soy products and Whole Foods brands did not participate in the study. Aside from the hexane often used in its processing, soy is dangerous in itself. It contains higher levels of plant-based estrogen than almost any other food. Estrogen dominance, a condition created by elevated levels of estrogen, is a leading cause of infertility, breast cancer, uterine fibroids and low libido. Soy contains trypsin inhibitors, which interfere with digestion and may lead to pancreatic issues, and also prevents the thyroid gland from receiving its necessary levels of iodine. Additionally, unless they are fermented, soy products contain phytates, enzyme inhibitors that block mineral absorption in the digestive tract. Therefore, it is safer to choose fermented options such as tamari, miso and tempeh if you should choose to eat soy. Luckily, there are many delicious alternatives to soy that also support good health. Beans, nuts and seeds are rich in proteins and are time-honored options in vegetarian and mainstream cooking alike. In recipes and as a tasty beverage, try almond or coconut milk instead of soymilk, and feel good about the food you are eating. Next articleIs Your Diet Making You Fat? Hey Buddy!, I found this information for you: "Veggie Burgers: This “Health Food” Might Be Hiding a Neurotoxin". Here is the website link: https://www.thealternativedaily.com/veggie-burgers-this-health-food-might-be-hiding-a-neurotoxin/. Thank you.